The $10 membership is good for a full year beginning on the day you sign up. 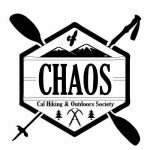 how can I become a member of CHAOS to check out geaR? Check out our how to join page. When do the hikes start? Hikes occur year-round and are always being posted. There is no start/end date for when trips happen. I don't have a lot of experience in the outdoors, is this okay? When will I be added to the email list? Us officers try to add you guys as soon as possible but sometimes we get busy. In general you will be added within a week of signing up. What kind of trips do you do? Anything and everything from beginner-backpacking to white-water rafting. If there’s something you want to do just email the list! what if i don't have a checkbook? CHAOS accepts credit and debit cards now!!! What if I want to use my gear for more than two weeks? This is possible, but it is dependent on the amount of gear you have and how much longer you will need to be extending it. Please talk to a gear officer about these circumstances. Gear is on a first-come-first-serve basis, so you may not reserve gear. You can text the current gear officer to confirm with them what gear is available. what if I don't have a cal id or driver's license? Please bring some sort of identification – some college ID, work ID, California ID, etc. I am/have returned my gear on time except for some items which i would like to use for longer. is this allowed? Yes, but it depends on how much gear you are using and how much longer you will be using it for. Please talk to a gear officer about your circumstances. i would like to rent gear for "x" number of friends, including myself. how much gear can i rent under my name? Any member can rent enough gear for themselves + one other friend. 1 member = up to 1 two/three-person tent, 2 sleeping bags + pads, 1 stove, 1-2 bear cans, etc. 2 members = up to 1 four-person tent, 4 sleeping bags + pads, 2 stoves, 2-3 bear cans, etc. I'm not a member of chaos - can i rent out gear in the place of my friend who is a member? Yes, but you must be able to provide all the necessary information of your friend when you fill out the rental form in their place. This includes name, Cal ID, phone number, email, and trip information. This friend must also be attending the trip with you. When I first checked out gear I thought I could return it on time but due to unforseen circumstances, I don't think I will be able to. Will I be charged the late fee? Yes. But you should email the officers as early as possible and let them know the situation and they may be merciful. Try to get a friend to return the gear in your place though. I'm renting out gear under my name, but won't be able to return it on time. Can my friend return it for me? Yes, and if you know this will be the case in advance, we ask that you provide the contact info of the friend on your gear rental form. I'm unable to attend any of the gear hours listed before my trip begins. Is it possible to rent any gear? Maybe. But please get in contact with our officers to see if anyone can accommodate you at an off-schedule time. Please be mindful that the officers are all busy students as well, and scheduling an extra gear hour is not our priority. I showed up to a gear hour and nobody was there...? Sorry for the inconvenience! We usually send an email out to the email list to inform everyone about our cancelled gear hour. You will not be charged with late gear due to being ghosted by an officer. If you want to be safe, you can always text the gear officer to confirm with them that they will be there. how can I donate/sell gear to the club? OF COURSE! Get in touch with the officers!